Customers that are dealing with a cleaning issue. Listed below are some of the factors that could contribute to slippery floors. If a floor is not properly dust mopped or swept, the residual dust can provide a barrier between the floor and shoe. Unfortunately, the dust moves under foot traffic. In a sports environment, the presence of dust is a serious problem because these activities are more intense and forceful than normal foot traffic. Thus, inadequate dust removal can cause a slippery floor faster than on a typical floor. Needless to say, this phenomenon makes it imperative that these floors have a frequent and effective floor cleaning dust control program. Entrance Matting – It is important to have effective matting placed at each of the entrances onto your sports floors. This measure will prevent some of the dry soil that could enter onto the floor. Preventative maintenance is usually the most cost effective measure to a cleaning maintenance program. Frequent Dust Mopping – Daily floor dust mopping is critical to removing the dry grit and dust that is on the floor. It is preferred that a treated dust mop is used because the dust mop treatment will improve the effectiveness of the dust mopping process. If traffic is heavy, it may be necessary to dust mop the floor more than daily. Check Vents and HVAC Systems – In rare situations, dust can come from the vent or air handling systems. If the vents or HVAC system cannot be cleaned, the cleaning frequencies need to be increased. Whenever moisture is present, dry soils can become absorb the moisture and produce “films” that are not removed by dry dust mop. It is necessary to use the proper cleaning procedures and chemicals to remove these films from the floors during a regular floor cleaning. The presence of any film on a sports floor can create a very slippery and dangerous environment. Wet shoes are a common source of moisture that accumulates on these floors and contributes to the development of films. Although wet shoes are the most common source, there are many other sources that can also leave a film on a floor. If this film is not properly removed, the floor will remain slippery and dangerous . Proper Cleaning Chemical – It is important to use a safe yet effective floor cleaning chemical. 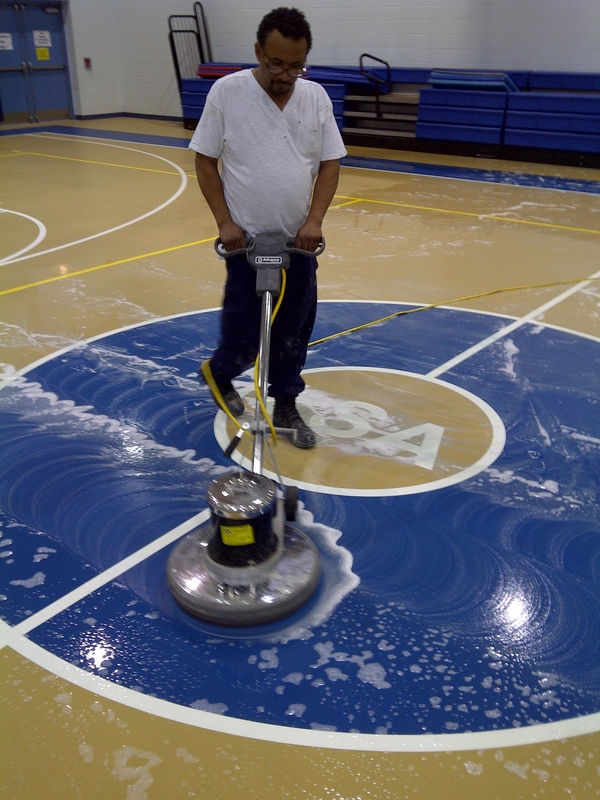 A synthetic sports floor should be cleaned with a neutral floor cleaner (7 – 9 pH). At certain times, it may be necessary to use a more aggressive cleaner to remove embedded soils off the floor. When using a more aggressive cleaner, it is important to rinse the floor so that no chemical residue is left on the floor. Use of an Automatic Scrubber – Because most synthetic floors have a high slip coefficient, soil removal can be difficult. The use of an automatic scrubber for floor cleaning is a critical piece of equipment because it not only applies the cleaning chemical, but it also agitates the floor, which enhances the performance of the cleaner. It is important to use the least aggressive pad to clean the floor. Typically, white or red abrasive pads recommended. Using anything more aggressive than a red pad may damage the floor. After the floor is scrubbed by the pads of the automatic scrubber, it is important that the cleaning solution is removed completely. Ineffective removal of a cleaning solution will leave a film on the floor that can leave the floor slippery. It may be a good idea to periodically check the performance of the automatic scrubber. If there are questions about the performance of the automatic scrubber, consult a cleaning equipment service center that can perform the necessary maintenance that will guarantee the best performance of the machine. 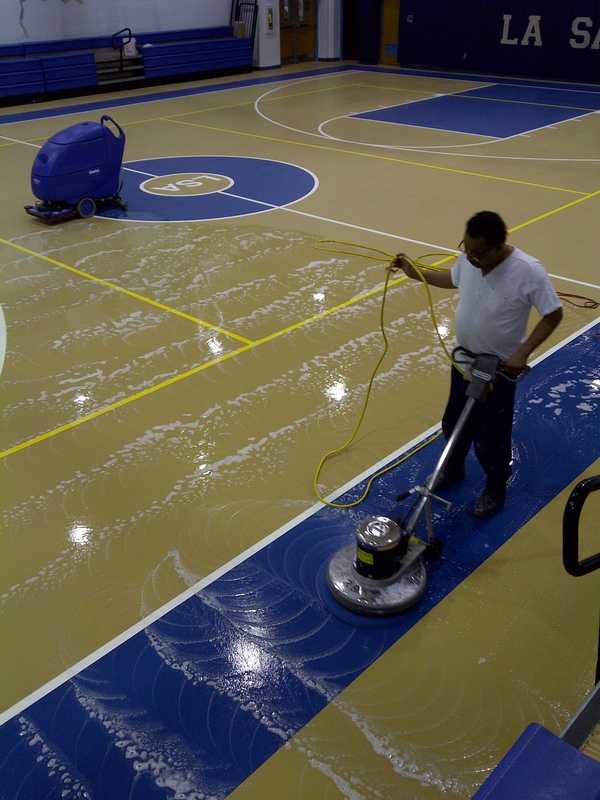 By taking the proper precautions and executing the correct cleaning techniques, an owner of a sports floor can easily and effectively maintain a clean and safe floor. previous post: Why and How to Choose a Multi-purpose Floor.